I’m sending you some pics so maybe it will help someone else. I wanted a way so I did not have to refill their water. So I took a five gallon bucket and put a toilet float in it so it would stay full. Then I just ran the water from the bucket to the chicken waterers. Put water inside the coop and outside. I know the chickens are really going to like these in the summers here in Arizona. They will always have fresh clean water. I loved your idea for the waterer for the chickens. I have had one for my dogs for years. They are great. Thanks again. Thanks for sharing, Jon! I love your solution, and I’m sure your chickens do too. matter what I tried. What’s the secret, Jon? Hmm — he didn’t mention doing anything special there. Did you use the right size drill bit? Good suggestion! We always tell people to add silicon if they’re concerned about leaks. On the other hand, we’ve discovered that using the right drill bit will stop most leaks before they start. > any home project. I made the bracket myself. No wonder the mount is so elegant! How far off the ground is John’s waterer? I’d say it’s about the standard (18 inches off the ground) that we recommend. Are you talking about the plumbing pieces that connect the bucket to the PVC pipe? Those are off the shelf parts that you can find in the plumbing section of most large hardware stores. I used the drain that is for a evap cooler. It has threads that fit a regular garden hose. They sell them separatly in the hardware store. Thanks for chiming in, Jon! Love the set up and soon to be building one for the warmer months here in MI. 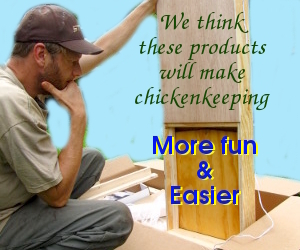 cofwhite45 — You might be interested in poking around our heated chicken waterer page. There are some options for heating PVC pipe waterers, although it’s tougher than bucket waterers.